Alexander von Humboldt Foundation for Nature Research and Travel was born in 1860 as the fruit of the inspiration of Alexander von Humboldt, an inventor and cosmopolitan, a fighter for the freedom for research, a humanist, and a model of academic excellence. When the main capital asset diminished significantly due to the inflation in 1923, the Foundation continued facilitating German researchers to travel to other countries to conduct research, with the aim of exploiting the international exchange in Humboldtian spirit to destroy boundaries and to promote universal knowledge. The new Alexander von Humboldt Foundation was set up by the German government in 1925 with the renewed aim at providing aid for foreign students, later academics, and doctoral candidates during their stay in Germany. After a period of inactivity, the Federal Republic of Germany reinstated the AVH Foundation (which holds the same name until now) on December 10, 1953 with the mission to encourage and promote academic collaboration between scientists and researchers from inside and outside Germany. Up to now, the Humboldt Foundation has produced 48 Nobel laureates, and the Humboldt Foundation alumni network has 26,000 scientists from diverse disciplines living in 130 countries. The foundation has become the German outstanding foundation which provides best support to its alumni. Humboldt Kolleg activity aims at strengthening the professional collaboration network at the regional level among alumni (Humboldtians) and introducing as well as enhancing the interest and spirit of young researchers for Alexander von Humboldt Foundation programmes and Germany as the research location. The Humboldt Kolleg activity is initiated by the alumni (Humboldtians) or their association and is financially supported by AvH. The Humboldt Kolleg has been held in different countries outside Germany (the United States, France, Italy, Poland, Nigeria, Kenya, South-Africa, China, India, and others). The participants are AvH programme alumni and young researchers who have made real contribution to the development of science. As such, Humboldt Kolleg has become a vital instrument in getting together the best young researchers, potential generation of leaders in natural sciences and technology as well as in other fields in Germany and even all over the world. Indonesia has become the host for the Humboldt Kolleg in 2011 and 2014 which was initiated by the Humboldt Ambassador Scientist for Indonesia. 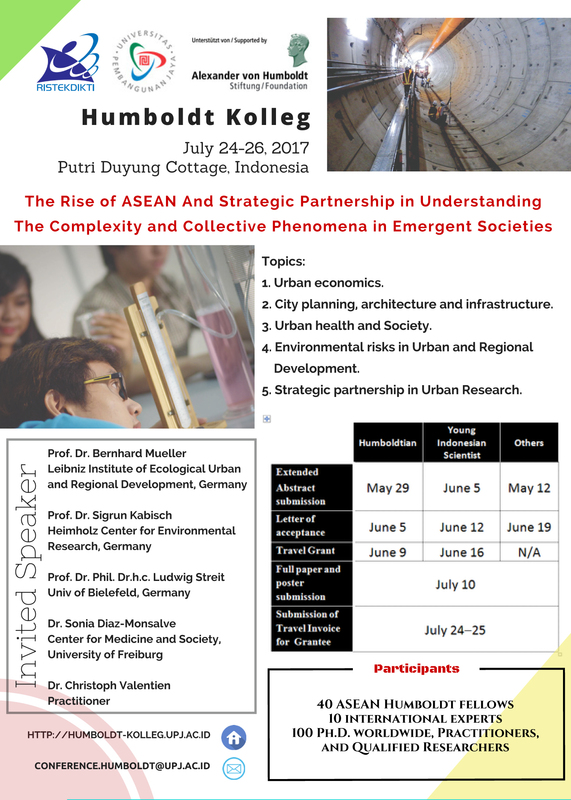 This year, Indonesia will again host the 3rd Humboldt Kolleg on July 24-26, 2017 at Putri Duyung Cottage, Jakarta (www.ancol.com). Universitas Pembangunan Jaya (UPJ, www.upj.ac.id) and the Pembangunan Jaya Center for Urban Studies will host and organize the meeting which will focus on “The Rise of ASEAN and Strategic Partnership in Understanding the Complexity and Collective Phenomena in Emergent Societies”. The 3rd Humboldt Kolleg will be organized in cooperation with the Ministry of Research, Technology and Higher Education of the Republic of Indonesia. Strategic partnership in Urban Research. These broad topics will bring together experts and researchers in the corresponding fields, making it a fertile ground to share and discuss ideas, knowledge, viewpoints, methods, research outcomes and policy ideas within the urban context. The targeted strong network among researchers coming from different institutions and various research fields within the urban scope will open up new possibilities for faculty mobility, research collaborations, and consortium for urban studies in ASEAN countries.